It will come as a surprise to no one when I say that marriage, it turns out, involves negotiations. Not the least of which is where to spend holidays. We are lucky in that both of us really like both our parents and our in-laws, but in a way it makes it almost harder because both of us would love to spend the holidays with the others’ family while at the same time we’re each devastated by the thought of missing a holiday with our own. It’s a win-win-lose-lose situation! This year the solution is to spend Thanksgiving with Joel’s family and Christmas with mine (which does mean we’ll be missing the Chanukah party with the painfully inept magician. Sigh.). And we discovered this weekend that this also translates into getting to participate in the sparkles and lights of Christmas festivities twice! I swear, we had no sooner wiped the crumbs of turkey and cranberry sauce from our lips and tossed our napkins onto the table with little groans of satisfaction, when a faint ring of jingle-bells began to tingle-lingle in the air. And the soundtrack (yes, this would be the soundtrack in my mind) crescendoed until the strains of “It’s the Most Wonderful Time of the Year” burst onto the scene. The weather in Washington cooperated with gusto, dropping a foot and a half of snow over a couple of days, turning the city into a giant snow globe, and enabling us to cross-country ski through the streets, waving at the cheery red-cheeked neighbors and the children out sledding. (Seriously, it was like someone decided we should spend the weekend in a Holiday greeting card.) There were presents to be selected and given. A chimeric Christmas-tree-Chanukah-bush to be cut down and trimmed. Carols to be sung. White Christmas to be watched. And, of course, cookies to be baked. Joel has firm, uncompromising ideas of what Christmas cookies should be like. They are shaped like stockings, stars, and snowmen and covered with sprinkles. I’m much less specific in my demands on holiday baking (though as I write that, Joel snorting in the background), but what I am certain of is that it requires cardamom. So, I decided it was the perfect opportunity to experiment with an idea that had been hovering in the back of my mind for a few months now, cardamom snickerdoodles. Overall I am unenthusiastic about snickerdoodles. I like the underlying buttery crumb, but except for gingersnaps I don’t really like crispy cookies, and most snickerdoodles you come across are pretty crispy. And the single note of cinnamon is not enough to make the sweetness interesting to me. They need something spicier, more sophisticated and complex. A little something like cardamom, perhaps. Cardamom is my all time favorite spice, and not just because it’s used frequently in Scandinavian baking (though that doesn’t hurt!). Its warm, subtly exotic scent manages to conjure up a foreign marketplace and a cozy kitchen all at once. It’s like no other flavor in the world. It all came together for me at a local coffee shop where they’re always experimenting and producing exciting new baked goods and sandwiches. It’s the sort of place where everything is delicious, but you should never get too attached to a menu item because the next week it will be gone. One of the days I went there to work this fall, there sitting on a plate at the counter was a golden stack of cardamom-currant snickerdoodles. They had me at cardamom. I couldn’t help but try one, just this once. It was, unsurprisingly, delicious. 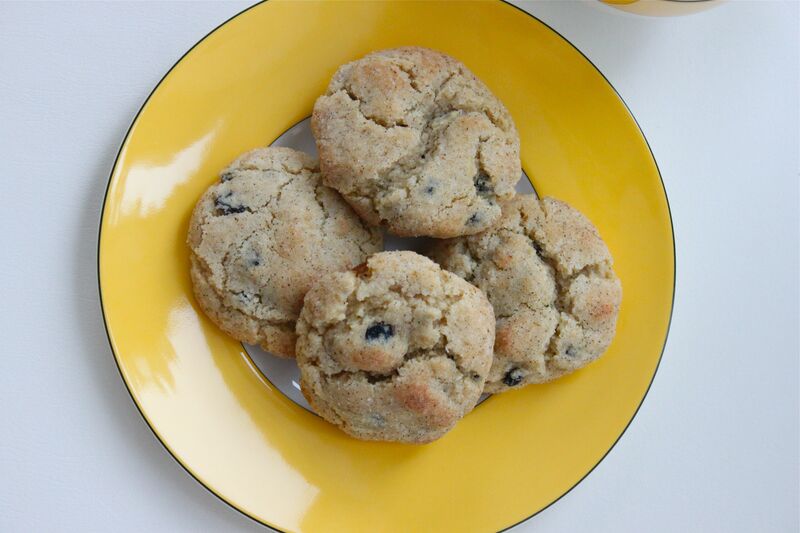 Soft and buttery, laced with cardamom and tangy bursts of dried currant. It tasted just like Christmas to me. This wasn’t a snickerdoodle, it was a snickerdøødle! So, now the trick became recreating them. I combed the internet for versions of snickerdoodles that promised to be soft and chewy. I found a few and experimented with their various techniques – higher temps, lower temps, chilling, not chilling, cooling on the baking pan, removing from the baking pan immediately. I found that making a dough with very little air stirred into it, a brief chill, a higher baking temperature, short baking time (the key is to undercook them as much as is feasible), and cooling off of the pan resulted in tender insides and crisp outsides. 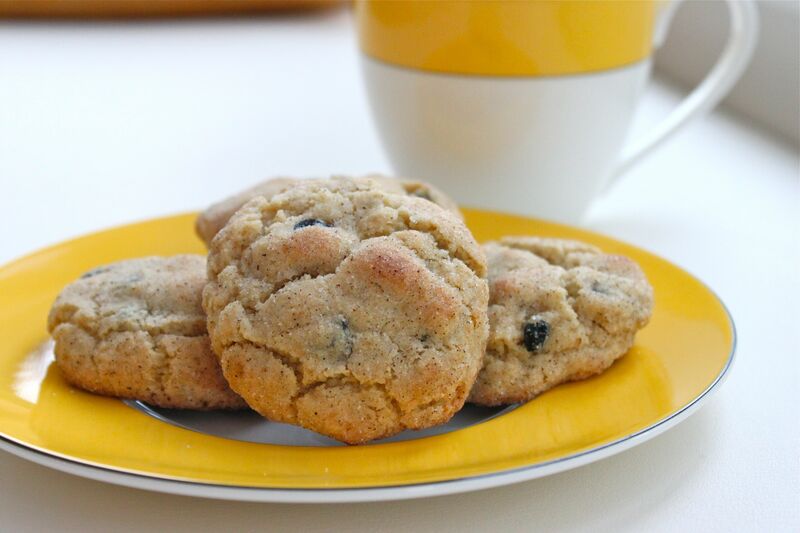 And the most important step, remove the cinnamon and pack the cookies with cardamom and currants instead. The resulting little gems, I think, may have earned themselves a permanent place on my holiday cookie roster. Preheat your oven to 425F. In a medium mixing bowl, stir together the sugars, flour, 1 tsp. cardamom, baking soda, cream of tartar, and salt. Whisk the eggs into the melted butter, then stir in the vanilla. Stir the wet ingredients and the currants into the flour mixture, stirring just long enough for everything to come together into a dough. Chill the dough in the refrigerator for 10 minutes. In a small bowl, stir together the 3 Tbs. sugar and 1 tsp. cardamom for the coating. Take out the chilled dough, roll it into 1 ½ inch balls, roll each ball in the sugar coating, then place onto ungreased cookie sheets with about 2 inches of space in between them. Bake for 8 minutes, until they look golden and cracked on top but still a bit doughy in the middle. Transfer immediately from the baking sheets to a cooling rack and allow to cool. Or, eat them nice and warm off of the cooling rack with a cup of coffee or glass of milk. Thanks! If you give them a try, I’d love to know what you think! I’m a cardamamom fanatic, so I found them quite easy to love, but I’d love to know what people who are not quite such lovers of cardamom think. Stop following me to Washington! I was also there Thanksgiving week 🙂 I hope that one of these days we will have the pleasant surprise of running into each other at SeaTac! Oh, Emily!! You continue to enchant me! I have yet to make it through your list of recipes, but I WILL!! Wow! Thank you!!!! Go soul sisters of the cardamom!!! 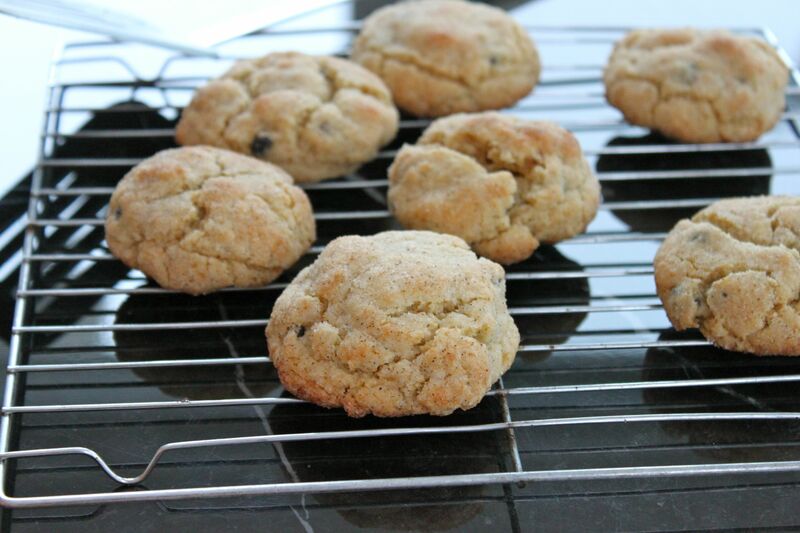 Just baked these tonight, what a wonderful combination, I can never get enough of cardamom. Thanks for the idea! 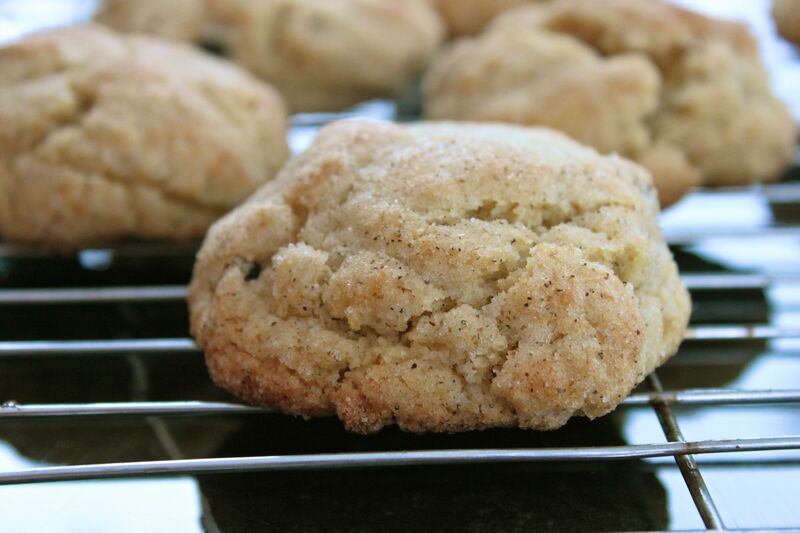 You are currently reading Cardamom-currant snickerdoodles at Five And Spice.